Aston Villa chief executive Paul Faulkner has urged the club and their fans to pull together following the 1-0 defeat at Crystal Palace on Saturday. Villa's fourth straight defeat left them just four points above the Premier League relegation zone. Faulkner issued a statement on Monday that read: "Now more than ever it's time for us all to pull together - fans, players, the manager, everyone." 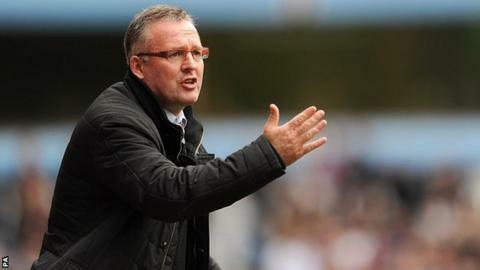 Manager Paul Lambert sought to play down relegation fears. "There's loads of teams and loads of games still to play," he said. But with the pressure mounting ahead of the final five games of the season, the club have called for unity. "Four games ago, on the back of two good home wins, we were looking up the table and feeling confident of a strong, positive finish to the season," Faulkner said. "Since then we have suffered four consecutive defeats and that is hard to take. We are hurting. Fans are hurting, players and the manager are hurting. The frustration is shared by everyone who loves Aston Villa. "Now more than ever it's time for us all to pull together - fans, players, the manager, everyone at the club. Our immediate focus and combined efforts need to be concentrated on our game against Southampton this weekend and on our remaining games this season. "We need to channel our energies into creating a positive atmosphere and getting the result we need on Saturday at Villa Park and in the games that follow. "Our fans have been magnificent throughout the season, as they always are. We are desperate to give them more to cheer about. I'm frustrated when we're not able to do that and I know the manager and players are frustrated as well. "We know we can handle adversity. What we need now is for everyone to stick behind the team and continue to show the great support that is a hallmark of our club."